I'm getting on my not so little soap box . What is it with grocery stores. They know you have to keep coming back for food; you can't live without it, yet they seem to go out of their way to make it the least tolerable experience possible. I spend over $8000.00 a year there, but am treated as though I am only buying a penny candy. I expect to be cheerfully acknowledged and my patronage appreciated. As the consumer we are continually told that our buying dollar has power, but I feel as though I am being sneered at by the big grocery stores. Why are they continually re-organizing their stores. First, they discontinue good brand names and replace them with inferior store brands. Arg, I can never find anything and it takes me ages to shop for the next few weeks after every re-design. Oh sure, some great marketing person decided that by re-arranging, the shoppers would really have to look for the products that they want and that in the process they would spy other products on the shelf that they didn't know they wanted to purchase and that they would then spend more money. Ha, I walk out in disgust with even less. Why are the soup flavours not stocked in alphabetical order. Again, they want us, the shopper, to have to look at many different varieties before finding the one we want with the expectation that we'll pick out a few extra. I don't know how many times I have walked away shaking my head with no soup in my cart. And I'm not the only one, I have spoken with others in front of the soup display who have done the same thing. If you are lucky enough to find the spot where your wanted grocery item is supposed to be shelved, there's a fair chance that it's not even in stock. How can this be. The major local chain here build a massive warehouse a short distance away yet many of my usual items are rarely to be found on the shelf. They admit they have supply chain problems, but that the warehouse will fix that. It's been four years at least since it was built, why are these problems still happening. The checkout. This is the final chance to make a great impression on the shopper, yet it has been a 'fail' far too often. One trip I bought a mere 8 or 9 items. When I looked at my receipt at home, over half of them had been charged incorrectly. I had to make a trip back to store to get a large refund. Being disgusted I went online to the customer survey. Surprise, surprise, the survey had not one question about the checkout experience. Remember, that's the part where I give the store tons of money. I called the follow-up number, of course they were gone for the day and invited me to call back. What, it was only 4:30 pm. The absolute final insult to the shopper is having to put money into the lock on the shopping cart to release it from all the other carts. Did the store forget that I spend over $8000.00 a year at their shop. They don't trust me with their shopping cart. What, am I going to steal it. No, I just want to buy food. I don't tend to repeat shop at stores that insult me by requiring me to remember to carry coins to release a cart. I will use the little hand basket and buy only a few light items and then I will choose to shop somewhere else that respects me. It's my choice where I shop, and if a store doesn't respect me and my $8000.00 shopping budget, then I'm not going to share it with them. Now don't get me started on stores that have an online division that charge you an extra service charge for shopping online. Needless to say I no longer shop with that store and they have lost a regular customer of 25 years. 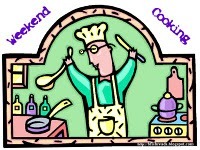 Join in the culinary inspired fun of Weekend Cooking which is hosted by Beth Fish Reads. I've many rants about grocery stores, too. I really hate it when they move a product I've been buying for years and then can't find it. My biggest beef is customer service. One time I asked some kid where such-and-such was, he didn't know what it even was. After I explained it, he went to ask someone else. He came back with a 5 mintue explanation saying that it was an old product and that no one was buying anymore, so they stopped making it. I then walked ten feet to the next aisle and found it. You better believe I went back to him and showed it to him. I was pissed. Don't get me started on the guy who sent my husband to the dairy section to find cheesecloth! Or the guy who didn't speak English. Or the guy who dumped a package of blueberries in my shopping bag and left me to clean them up. Called the manager on that one. I really don't mind the money in the carts thing, though. Here, it encourages people to return the carts to the cart corral rather than leave them in parking spots. You can really tell which stores have coin carts by the "clean" parking lots. Otherwise, 1/3 of the spots are taken up by abandoned carts. I also hate when they re-organize everything or move things. When they do move things and you ask about them you usually get "I don't know" or "I never heard of that". I usually ask for the manager and they will look it up, while you wait, forever! This is one of the reasons that I love to shop at my Costco...I have always found the customer service to be exemplary, and whenever I have had to return something it has been entirely hassle free. I wish I could buy all my grocery items there! Heather, you wouldn't be very happy in Europe! There is not ONE groocery store in Germany where you do not have to insert money into your cart. First I was like you, but now I don't even think about it anymore. You didn't mention just plain rude behaviour on the part of the sales staff! Someone smart once told me all they owed me was civility but you know, some of them can't even manage that! Thanks for the rant. I'm glad to know I'm not alone. I agree with the whole "re-organizing" thing. Just when I know where everything is, they rearrange the store and I can't find half of what I'm looking for. But I love the stores where you have to put a quarter in for a cart. No more having to get out and move a cart to park. LOVE IT!!! The worst is when they stop carrying the brands you like. Right now we are going to three (yes, three) different stores to get the products we want at the prices we want. It's totally insane. I can't wait for the farmer's market to start up -- then we will hardly be in a grocery store until November. We have to put money in the slot to get our trolleys too. Whilst it is a pain, I heard somewhere that each one of those trolleys costs something like $1000AU, and therefore they only need to have 8 or 9 trolleys stolen or vandalised by idiots to match off your shopping budget for the year. I enjoy grocery shopping and that kind of thing takes the fun out of it. So do rude cashiers and unpleasant managers. Go Heather. You are right on! It could be said that you are complaining about a local situation, but you are not. We travel all over the country and it seems to be a common problem everywhere. Because I am often shopping in an unfamiliar store I have my own system. I shop the perimeter of the store which always has the necessities (produce, meats & fish, dairy and breads. It's when I have to go into the aisles that I become frustrated with the things you are mentioning. Items should be organized in some logical method but I often wonder about their logic. At the checkout counter I always make a special effort to look directly in the face of the clerk and talk super-friendly to them. To me that's the final test. I can see having a bad day but when someone deliberately snubs a one-on-one friendly expression, they haven't just turned me off, they've done it to everyone they meet. In my opinion this signifies poor management. As to the quarter per cart idea, I'm afraid I like that practice. I keep quarters in a tray in my car in case that's the practice or a store. At least I know I'll get a cart. It seems that those stores tend to be less expensive too. Great essay on a subject that effects us all. Oh dear, that sounds like a bad supermarket! I think that putting money in trolley slots is a very common practice, and some supermarkets use automatic locks when the trolleys are a certain distance from the supermarket itself. It's to prevent people from taking them home. And unfortunately, this happens a lot. So I agree with Marg here. As for the store constantly reorganizing and favorite brands being replaced, I commiserate with you. And what's up with those check-out people? Making so many mistakes?? Glad to hear you've found another place to shop. Hopefully they will give you better customer service!